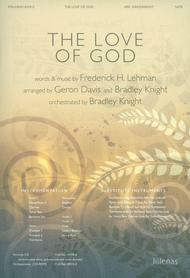 The Love of God (Anthem, 2011) composed by Frederick M. Lehman. Arranged by Geron Davis & Bradley Knight. For SATB choir. Anthems. Adult Choral Anthem for Worship. Praise & Worship and Sacred. Moderate. Octavo. 16 pages. Published by Lillenas Publishing Company (LP.9780834181090).ISBN 9780834181090. Praise & Worship and Sacred.With light-handed, acoustic styling, by Bradley Knight, this old favorite is vocally accessible for choirs of all sizes and sure to become a new favorite for your choir and congregation. The fresh, unexpected new choral treatment of this enduring classic,.